I remembered that I once made a post about my love of foreign films and wanted to fill you in about some of the films I have in my collection. When I did a search on my blog I was a little shocked that it’s been two years since my last film post: https://kiwidutch.wordpress.com/2011/02/18/new-312/. I’m not going to spoil this movie with a plot summary or details of the best bits because anyone who’s intending to watch this needs to be delighted by these discoveries themselves. 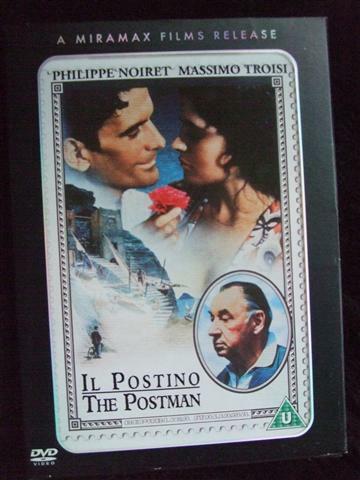 Instead I will just tell you that watching the film “Il Postino” is something to put onto your bucket list and see if ever you have the opportunity. “Les fugitifs” of the previous post will always remain an all time favourite but “Il Postino” is in my top 5, and I think that like the French, some Italian directors have turned distillation of an entire scene into an essential beautiful moment captured by a emotion, a face, a voice or humour into an art form. Also like the French, I feel they more often credit the audience with the intelligence to use their imaginations and fill in the gaps for things like bedroom scenes. A discarded stocking on the floor is enough to tell us all we need to know… we don’t need a graphic guide with the A-Z of events to enlighten us to what’s going on. Most of all I like the humour, it’s found in the most unlikely of places: little gems sprinkled throughout the movie that round out and complete the characters, they laugh equally at weaknesses as well as pleasures and you identify with the characters all the more strongly for it. My recommendation: Find this in your local library, or video shop or where ever you can and discover the joy of this excellent movie.